Monday, November 26, 2007, I arrive at home at 10.45PM. When I look at the trip indicator, it shown at 10,011km. That mean Amsoil has been pass the 4000km trip. 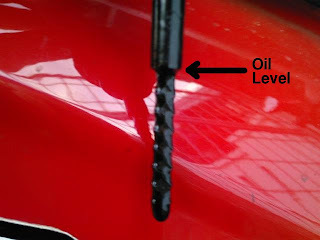 This is the right time to see the oil quality. Amsoil recommend the user to use it doubled from factory default. My scooter factory recommend changing oil interval is every 2000km. I want to check the oil quality right now, but my body refused it. I'm too tired to do the job. Tuesday, November 27, 2007, I wake up at 5.30AM and go to the garage. I open the dipstick and pour some oil and see the color. Left is the oil concentration. As you can see the color is dark but not to dark. When I tried to flattened the oil (right picture), I can see there is still gold color. That mean, I can still using this oil farther more. I now that this is not a good test. Because, used oil has to be check in the lab before I can used it for some more trip. As we can see, this is still good enough. The oil level is still on the maximum. That mean I don't have to added some more. The engine sound is no change at all, still as low when I first time tried this oil. I'm pretty comfort with the sound. I think this is the lowest engine sound I ever had. The power is a little bit down, not much. Usually when I stay on the 5600RPM, the speed is about 60kmh. But now I need 5800RPM to get to 60kmh. The torque is no change at all. I can climb 40 degree hill on tandem with my wife without any difficulties.